Common dates are worth at least $100+ in the lowest grades and key or semi-key dates (low mintage dates and mints) can be worth $200-$350 in the lowest grades. The 1878-CC is the key date with a mintage of 97,000 and it’s value dramatically increases with each grade jump and it’s worth $350 in the lowest grades. All of the CC (Carson City) mint marked coins are lower mintage and more valuable. Note: Collectors beware! Counterfeit Trade Dollars are numerous so know what years these coins were minted and learn to identify fake versions. 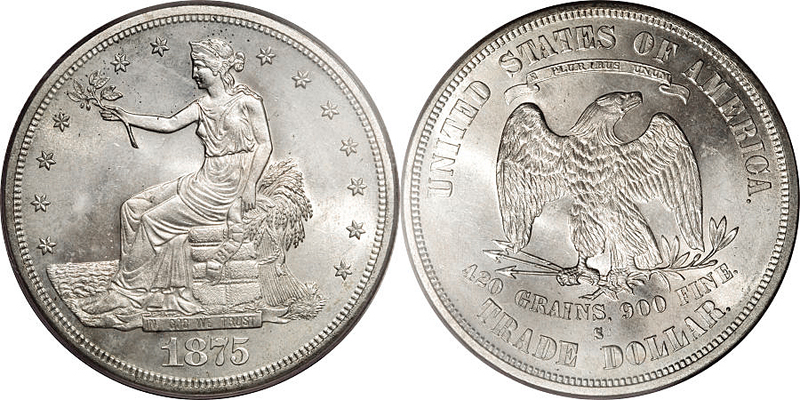 Trade Dollar value depends a lot on the grade of the particular coin no matter how rare the date and mint might be. A common date 1873 (no mint make, Philadelphia Mint) can be bought for $100 in G4, but in mint state (MS), uncirculated grades, they’re worth $2,000 and up. You can buy some common date Trade Dollars for less than $100 if they’re damaged, scratched, holed or harshly cleaned. All Trade Dollar values in AU (About Uncirculated) grades are worth several hundred dollars and several thousand in the mint state grades. All no-mint mark versions from 1878 through 1885 are proof only and extremely rare and these are worth several hundred to a few thousand depending on their grade and the 1885 with only five known is worth at lease 1.5 million dollars. Varieties: The most well known varieties is the 1875-S Over CC and the 1876-CC Doubled Die obverse and they’re worth several hundred dollars each even in the lower grades of Very Good (VG). The Cherry Picker’s Guide list several other varieties to look for like 1873-CC Misplaced Date (MPD), 1876-S Repunched Sate (RPD) and 1877-S Doubled Die Reverse (DDR) just to name a few. Mint marks: None (for Philadelphia, Pennsylvania) above the D of DOLLAR on the reverse, S for the San Francisco Mint and CC for the Carson City Mint. 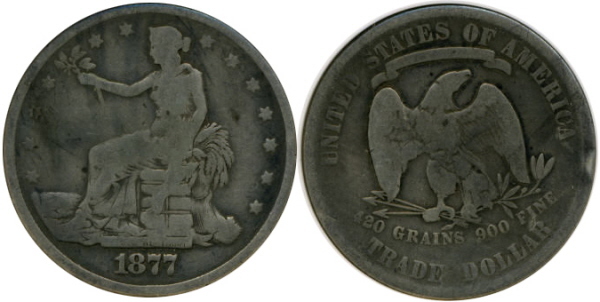 Trade Dollar value. What a Trade Dollar is worth.